This past week we picked the last of the peaches off of our little trees and so I’ve been busy coming up with some new recipes to use them all up while they are at their peak of flavor. One of my favorite things to grill are chicken thighs as they stay moist and tender on the grill, are very versatile, and are inexpensive as well. For this recipe, I marinated the thighs for a couple of hours before grilling, then served them with a delicious relish or salsa made from our fresh peaches. I find the salsa improves with flavor as it sits and and the flavors meld, so I would suggest making it at least an hour before you fire up your grill. We use a charcoal grill here in Umbria, but a gas grill would work just fine as well. I always remove the skin and trim off any fat from my chicken thighs to keep them as lean as possible. Chicken is lower in fat and calories than other types of meat and contains protein, niacin, iron, and zinc. Removing the skin and trimming away and excess fat helps to keeps chicken thighs lower in calories and fat. Peaches contain 10 different vitamins and are a particularly good source of vitamin A and C. Peaches are also high in fiber and are a good source of potassium though they do contain some magnesium, phosphorus, zinc, copper, manganese, iron and calcium as well. 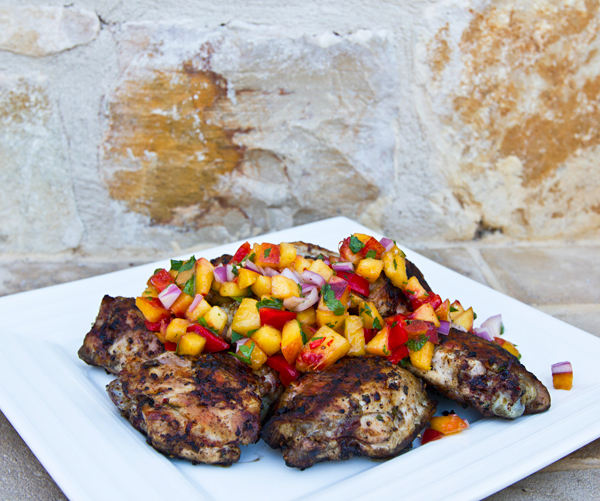 Simple chicken thighs gets a summer makeover when topped with fresh peach salsa. Cut the peaches and red pepper into a 1/2 inch dice, then place in a bowl along with the onion, parsley, salt, lemon juice, olive oil, and chili pepper if using. Toss to mix well, cover and set aside. In a shallow casserole dish mix the olive oil, lemon juice and zest, ginger, garlic, and parsley. Season with salt and pepper and then add the chicken thighs and toss to coat. Cover the dish and refrigerate for at least two hours. Prepare a medium-hot fire for grilling or preheat a gas grill, and arrange a rack 3 to 4 inches from the heat. Brush or spray the grill rack with oil and arrange the thighs on the rack. Grill the chicken 5 to 7 minutes per side or until opaque and cooked through. 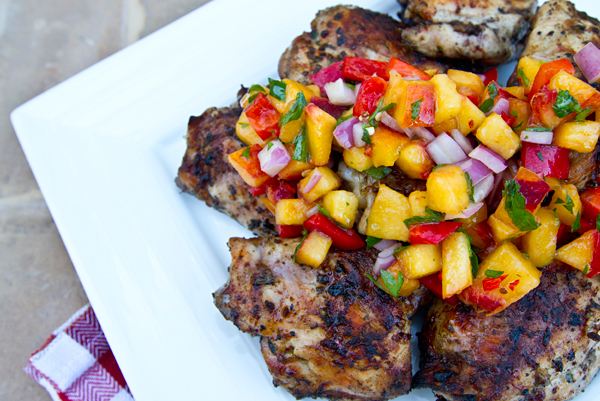 Place the grilled thighs on a platter, top with the peach salsa and serve.